After your item has been packaged, it will be shipped and delivered via one of the following carriers and methods. Current Domestic Shipping Rates will apply. Read below for more information about the shipping methods we offer. For orders to up to $10,000.00, we will ship using Priority Mail (3-5 Business Days) or Express Mail (Next Business Day). We do not ship to P.O. boxes. For orders of more than $10,000.00 please contact Customer Service or call us toll-free at (877) 766-8242 for rates and delivery time. We ship most "in stock" merchandise within 3 business days. If you order any merchandise that is not available, it will be noted on your sales ticket included with your order. US Mail or standard ground service without any additional shipping/handling charges ships all backorders that remain after original shipments. On all engraveable items, please allow 7 additional business days for delivery. US Mail or standard ground service without any additional shipping/handling charges ships all backorders that remain after original shipments. If your delivery is over $1,000 we require a signature for delivery regardless of any waivers you have from FedEx®. If your delivery is under $1,000 and shipped FedEx Priority Overnight®, FedEx® may require a signature. These requirements are for your protection. If you would like to arrange delivery to a FedEx® location call one of our customer service agents toll-free at (877) 766-8242. If for any reason you are not satisfied with your purchase you may return the item, in its original condition with the receipt, within 7 days of the purchase date for a full refund or an exchange. After the 7 day period and up to 30 days from the purchase date, the item may be exchanged with the receipt, or a store credit may be issued. All returns or exchanges must be approved by management and may be subject to a 25% restocking fee. There are no returns or exchanges for custom made pieces, engraved items, stock items altered at the customer’s request and items that have been altered in any way. In the case of loss or theft of a repair while in our possession, replacement value will not exceed the declared value of the item being repaired. We reserve the right to replace the merchandise with merchandise of equal value. Watch repairs require a NON-REFUNDABLE deposit of $25.00. The deposit may be applied to any work done to the watch. Any Cleaning, Oiling and Adjustment (COA) or replacement of watch movement has a 6 month warranty on the movement of the watch. Special conditions apply for watches sent to the factory. Battery replacement: Hannon Jewelers is not responsible for water resistant watches after battery change if we do not perform a water test. Once we receive your returned item and it is accepted, your refund or new item will be processed in just a few days. Upon receiving your return, the item will be reviewed by our Quality Assurance Department. Please note that items showing signs of wear or those that have been engraved, altered, resized (by a jeweler other than Hannon Jewelers), or damaged in any way cannot be accepted for return. Returns with without a Hannon Jewelers Return Code, and packages that are improperly packaged or uninsured will be refused receipt. Your Return Authorization Code. Call (877) 766-8242 and request a Return Authorization Code. Write this code on a copy of your original invoice and in a prominent and visible place on the outside of the box you are returning. Package Your Return. Include all original packaging and collateral material. If your item was delivered with a diamond certificate and that certificate is not returned, you may be liable for the $250 replacement cost. Note: For security reasons, do not write "jewelers" anywhere on the outside of the package. 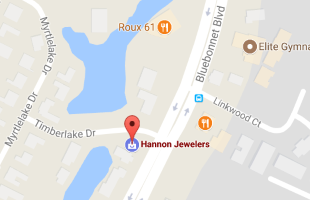 *Hannon Jewelers is not responsible for loss or damage of return shipments. *Please note: Our return policy is subject to change without notice.